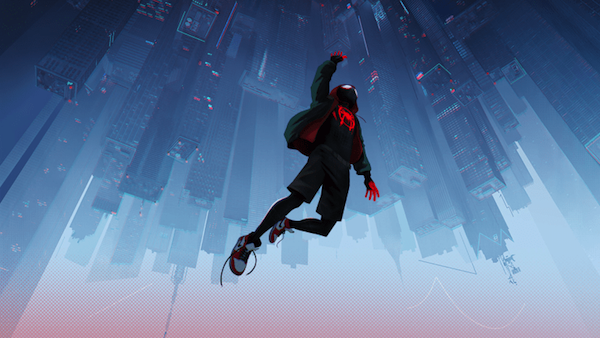 Here at High Five: The Podcast, we’re a family show (don’t let the constant cursing and inappropriate references fool you), so when we saw a new TrailerTown for Spider-Man: Into the Spider-Verse come out, we knew the kiddies would be interested in Sony’s newest take on the Spider-Man character. Honestly, Sony’s upcoming take on the friendly neighborhood insect-based superhero looks really good, even if it may be unnecessary. There are many things that get us excited about this outing (which we’ll detail below), but rest assured, this looks like a fun, new take on a character we’ve known for decades with even a new visual style to boot. TripleVerse – Speaking of other universes, one smart thing this TrailerTown does early on (0:35) is establish that this isn’t our universe (the one where Tom Holland plays a young Spider-Man in the MCU). That takes away the initial cognitive dissonance between already having theatrical Spider-Man movies and gives us the freedom to enjoy and explore this new realm. As of right now, it appears Sony is playing with at least three universes for Spider-Man characters (MCU Tom Holland, Venom, and Spider-Man: Into the Spider-Verse). Give us our bus tickets, we want to live in a world with many Spider-Mans. Voice Blast – A truly great animated film needs the right voice cast. Between Shameik Moore (The Get Down), Jake Johnson (The Mummy), Hailee Steinfeld (3 Days to Kill), Liev Schreiber (Wolverine: Origins), Lily Tomlin (The Magic School Bus Rides Again), and Mahershala Ali (The Curious Case of Benjamin Button), they have the cast covered up. Spider Infestation – In pretty much every theatrical incarnation, there is only one Spider-Man allowed on screen at a time. Not only does this movie do away with that notion, they are introducing a whole SLEW of new Spideys. In this TrailerTown alone we see Peter Parker, Miles Morales, and Gwen Stacy in their respective insect suits. We hope there are even a few more Spider-Men hiding around the corners (looking at you Spider-Ham and Zombie Spider-Man. Old Man Peter – It appears in this TrailerTown that the Peter Parker of this movie is no longer the young, brash teenager that we’ve known in past iterations. It looks like they are going to portray him at the older(ish) hero who’s been doing this a while and is ready to bring on some new recruits. It’ll be fun to see a war-torn Peter as opposed to the wide-eyed novice that most Spider-Man movies like to start with. Will you be donning 3D glasses and heading to the theater this Christmas to see Mile Morales swing around New York City? We know we will! Leave your thoughts in the comments below.